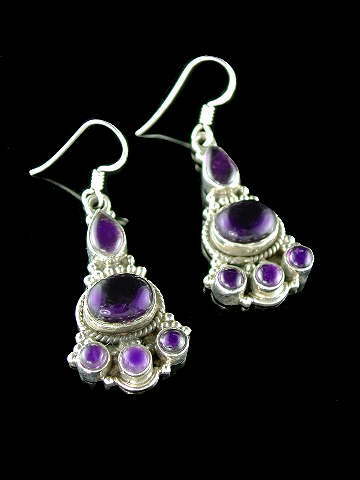 Unusual and very attractive deep purple Amethyst earrings with five cabochons set in each. Finished in a 925 sterling silver Balinese-style setting. Amethyst enhances the function of the Brow or Third Eye Chakra; protective and powerful with a high vibration. It has been used throughout the ages for its protective properties; to protect from fear, guard against bad dreams, to absorb and dispel negativity, and is favoured by healers for its ability to focus energy. Once prized by royalty, nobility and ancient energy workers alike, nowadays, because of its ready availability it is often overlooked in favour of some of the more exotic or rarer stones. Try sitting with or wearing a piece for a while, and reconnect to its endless possible uses!